With multiple car accidents in New Canaan this year, two of which were deadly hit and run incidents, the town and Connecticut as a whole has cracked down on distracted driving. It is easy to see. One quick look and you will easily find a distracted driver. They might be talking on the phone, texting, eating or even shaving. "You don't have to be a cop to see it everywhere," New Canaan Police Sgt. Carol Ogrinc said about people using their cell phones while driving. The New Canaan police have begun cracking down on the epidemic that caused 1.6 million accidents in 2008 around the country. "It is kind of like the seat belt issue," Ogrinc said. "At first, many drivers never wore their belts. Then once Click It or Ticket came about, everyone started following the rules. 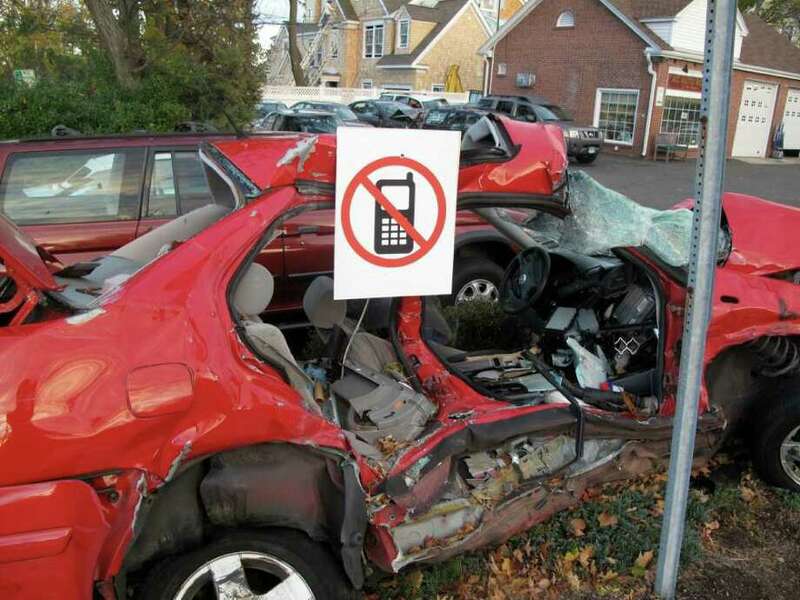 I think that this will be the same case with cell phones and driving." In just one month between October and November, a total of 891 drivers had been stopped for cell phone usage. There was also talk, at one point, about possibly confiscating cell phones from the drivers in moments of "intense investigation." "That was just an idea that was tossed around that was never really seen through," Ogrinc added. Nationwide, the distracted driving issue has been a problem for years. Statewide, it has become more troublesome with the advent of texting. Connecticut recently enacted some legislation to make it illegal to text while driving. New Canaan has followed suit with this aggressive crackdown on the problem. In a message to New Canaan residents before the initiative began in October, Police Commission Chairman James Cole stressed the seriousness of the matter. "We have experienced several very bad accidents in recent months, with some resulting in deaths," he said. "While we don't know that all of these incidents involved cell phones, we do know that a large percentage was caused by distracted drivers." According to police, officers stopped 150 drivers using their cell phones while driving during the months of June through September. Cole reiterated that he believes that was only a small percentage of drivers. His assumptions are most likely correct; during the first week of November, officers stopped 61 drivers for driving while phoning and texting. Of those 61 drivers, 40 received ticked infractions, 20 received verbal warnings and one received a written warning. That would make one week's stops account for a staggering 40 percent of the 150 drivers stopped between June and September. Additionally, the police are not the only ones in town raising awareness for distracted driving. Anthony Ceraso, owner of AC Auto Body, is trying his best to make drivers aware of the dangers. In front of his shop sits a totaled vehicle from an actual accident involving a teenage girl with an image of a crossed-out cell phone in front of the car. "My intent is to bring awareness to the possibilities of what could happen," Ceraso said. "I believe that this in conjunction with [what the police are doing] would be more impactful." Joining Ceraso in the crusade is New Canaan resident David Lee, owner of the tech company Celif. "We see so many people out on the road texting and talking while driving," Lee said. "Adults as well as teens are culprits." Six months ago, Lee, who lives in New Canaan, and his partners at the Wesport-based Celif, began developing a mobile application for cell phones that would disable the distraction while users were driving. "A lot of people were using apps to make games and various other things," Lee said. "But nobody was really looking at safety and security." That need for safety is what brought Celif to launch its new app called HALTdwd. The app works according to the speed of the car and always runs in the background of the phone until driving commences. Once the car is traveling at faster than 5 mph, the HALTdwd kicks in and blocks all incoming texts and calls until the car is in park. But what does that mean for cars at red lights or in traffic? The app will only stop working if the car is stationary for more than two minutes. "We have set this so that stoplights don't have the user on the phone and then driving and talking or texting," he added. "This way we are trying to eliminate the accidents at lights and crossings where the driver is distracted." The launch is still very preliminary but Lee hopes it raises awareness on the issue of distracted driving. According to the National Highway Traffic Safety Administration, driving while distracted has resulted in the deaths of almost 6,000 people in 2008. The price will be $9.99 per year; a figure dramatically lower than most of the other applications and advanced technological options available for cars that effectively serve the same purpose. But Lee himself is not too concerned with the bottom line as he is about making a point. "I love this town and I have kids," he said. "I just want it to be safe for them." For more information, contact Lee at dlee@ittechnology.com.